Originally published in Your Smithfield Magazine – March, 2010. Officially, with a wink and a nod, there were no unlicensed liquor establishments in Smithfield. As the sun settled low on the horizon casting long shadows that marked the end of the day, five men stood on the platform of the Enfield station waiting for the evening train. (Enfield later became known as Esmond.) To the untrained eye, they might have looked suspicious grouped together in their long overcoats, but they were in fact a contingent of Smithfield police officers under the command of Town Sergeant Jenckes Smith. Their mission that evening was to conduct surprise raids on unlicensed liquor establishments in Georgiaville, but to accomplish this Smithfield’s tiny police force would need extra men and that was the purpose of meeting the train. The train arrived shortly before 5 p.m. and two officers from Johnston and one from East Providence disembarked. After a brief discussion, the eight men set off for Georgiaville. The date was December 19, 1898. In today’s day and age, one may wonder why such a show of force was necessary to raid unlicensed liquor establishments, but to understand history, one has to take into account the values and attitudes of the times, and not be prejudiced by Twenty-first Century hindsight. The officers were only doing their jobs by enforcing the law, but what set the night’s events into motion was a local political battle that had begun months earlier. The 1920s were not the only days of prohibition of alcohol in America. 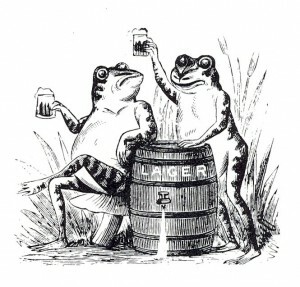 In Rhode Island, prohibitionists were active nearly one hundred years earlier, and over time they gained enough political clout to get laws banning the sale and use of alcohol passed in 1852, and in1874, but both laws didn’t remain in effect for very long. Yet another Rhode Island prohibition law was enacted in 1886 that was repealed in 1889. At the time it was repealed, the matter of prohibition was left up to every city or town to determine for itself by popular vote whether to remain “dry” or go “wet”. Smithfield elected to remain a “dry” town by a vote of 155 to 121. Human nature hasn’t changed since the beginning of time, and as with any banned substance, those who want it will seek out those willing to fill the demand. So it was that many liquor establishments operated throughout Rhode Island in spite of state laws or local ordinances. Smithfield was still a small town in 1898; the kind of place where everyone knew everybody else. Officially, with a wink and a nod, there were no liquor serving establishments within the Town of Smithfield, despite the fact that several were known to exist. This situation more or less remained a non-issue until the matter of granting liquor licenses came up before the town elections held in the spring of 1898. Who raised the issue is not clear. Perhaps it was brought forth by those selling alcohol who wanted to legitimize their businesses. Whatever the case, the matter of issuing liquor licenses was defeated by a narrow margin of only ten votes; 112 in favor; 122 against. The town would remain “dry”. After the election it seemed that business would return to normal, but then a group of concerned citizens approached the newly elected Town Council with a petition demanding that some action against the liquor establishments be taken. There was after all, a law. The initial response of the Council was that there was no money to fund such enforcement measures. However, the issue had ignited a political fire that demanded attention, and forces were rallied. At a town financial meeting held June 14, 1898, it was voted that $500 dollars be appropriated to enforce the law. Sentiment ran so deep that it was added that if the $500 should not be enough, more money would be allocated. The voters had spoken, and the politicians had listened. This should have been a warning to anyone in the liquor business that trouble, at least for them, was coming. The first stop for Town Sergeant Smith and his men were two reputed establishments near the railroad crossing on Farnum Pike. One proprietor, apparently having received advanced warning, was caught in the act of trying to empty his supply. After claiming it was all the liquor he had, more was found on hidden under a trap door in the floor. The owner of the other business was not there, but at his “regular” job at the Bernon Mill. An officer was sent to arrest him, but he fled before the constable’s arrival. Word of what was afoot spread quickly throughout the village and there were some, no doubt, who disposed of their private stock down their kitchen sinks. However, the officers were after bigger fish, and concentrated only on businesses that had been previously observed openly selling alcohol by undercover “spotters”. The next stop on the list was a well known bar room. The bartender had made every effort to empty all bottles and jugs before the officers arrived, but he forgot about a quantity of liquor hidden at the bottom of a coal bin and was arrested. 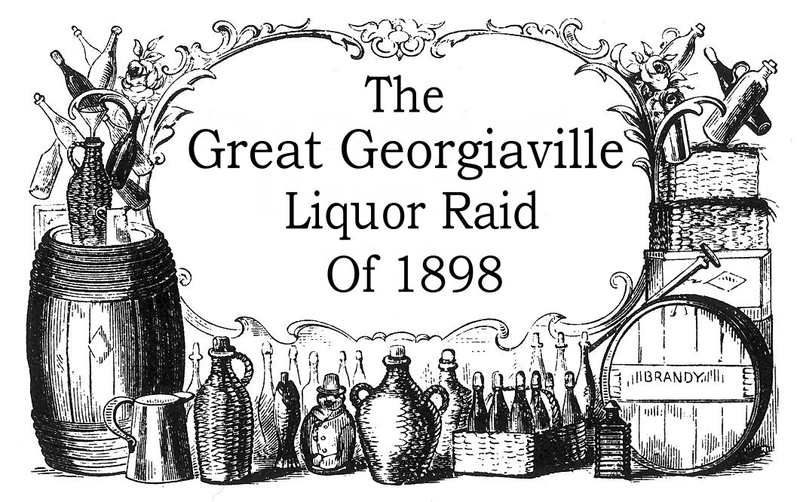 The largest quantity of booze was found at what had once been called the Georgiaville Hotel, today a private residence. Apparently the proprietor was one of a handful in the village that hadn’t received word of what was happening for he had made no attempt to empty his merchandise. Caught red-handed, he cooperated with police, and turned over two-and-half barrels of beer, six gallons of whiskey, and nine more of cherry rum. The last place to be raided was a barber shop where It was rumored that the barber would cut hair in the front while running a bar room in the back. No liquor was found on the premises, but the owner was taken into custody anyway because one of the undercover “spotters” had seen him serving alcohol on an earlier occasion. When it was over, four men were in custody and the hunt was on for another. The amount of contraband seized filled two buckboard wagons. Of the four men arrested that night, one pled guilty, was fined $20, and given ten days in jail. The others duly pled “not guilty” and were released pending the outcome of their trials. 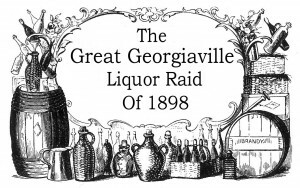 The raid was reported in a local newspaper, and one might gather from the article that unlicensed drinking establishments only existed in Georgiaville. However, it was also reported that a Greenville man had been arrested and was awaiting arraignment on “similar charges”, but his name and the location of his arrest were not recorded. In any case, one can be sure that alcohol consumption wasn’t only confined to the Village of Georgiaville, and the raid of 1898 sent a loud and clear message that liquor establishments in Smithfield would not be tolerated – at least for awhile. Filed Under: Articles Tagged With: Chief Jenckes Smith Smithfield Police, Georgiaville Hotel Smithfield R.I., Jecnkes Smith Smithfield RI, Prohibition in Rhode Island, Prohibition in Smithfield R.I., Smithfield Police History, Town Sergeant Jenckes Smith Smithfield R.I.